What do I do when the warp loses tension? If this happens, you are beating too hard. Try just swinging the beater to tap the weft in place. If you must beat hard, used the ratchet brake and not the automatic tensioning system. How do I keep my folding loom from collapsing? 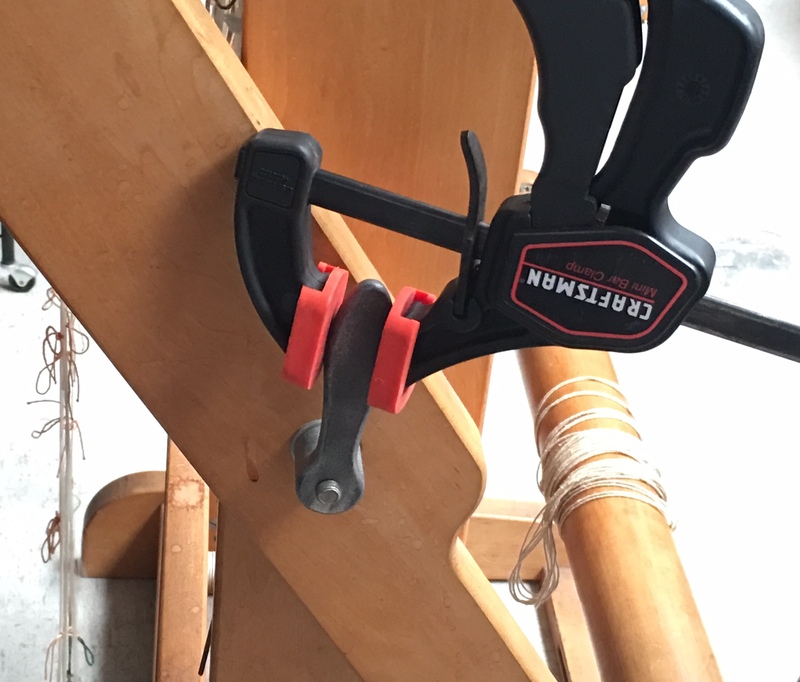 Attach a clamp to the handle to get extra force (torque) on the handle when you tighten it. 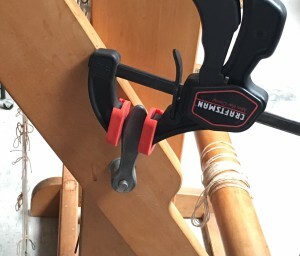 This is the clamp I like. Why is the weaving space so narrow? It doesn’t need to be any wider because it is so easy to advance the warp using the automatic tension system. Good weaving requires you advance the warp often, besides. Where are the aprons? Why is there a groove in the beam? Jim expected to make Temporary Aprons to use when beginning and ending weaving. The slot in the cloth beam is so you can place the cloth with two sticks into it and wind up the cloth smoothly on the cloth beam. Read about a temporary apron in the Beam and Winding On section. 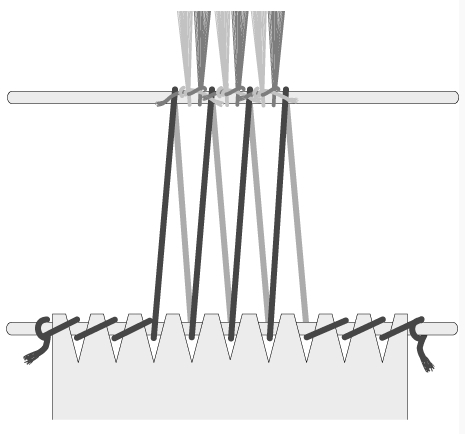 The beam slot in the warp beam is for the end stick and also so the warp can be wound smoothly on the beam. Read more in the section about Beams and Winding On. When weaving the end of the warp, you’ll need to put in a temporary apron so you can weave up until the end stick is right behind the heddles. Why are there string heddles? To keep the shafts light. The ash wood Jim Ahrens used for the shafts is perfect for the job to keep the shafts light in weight and thin so they don’t take up much space. 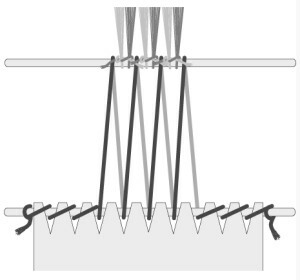 Why do some looms fold? So they can pass through a doorway. Why are there 10 shafts and only 10 treadles? 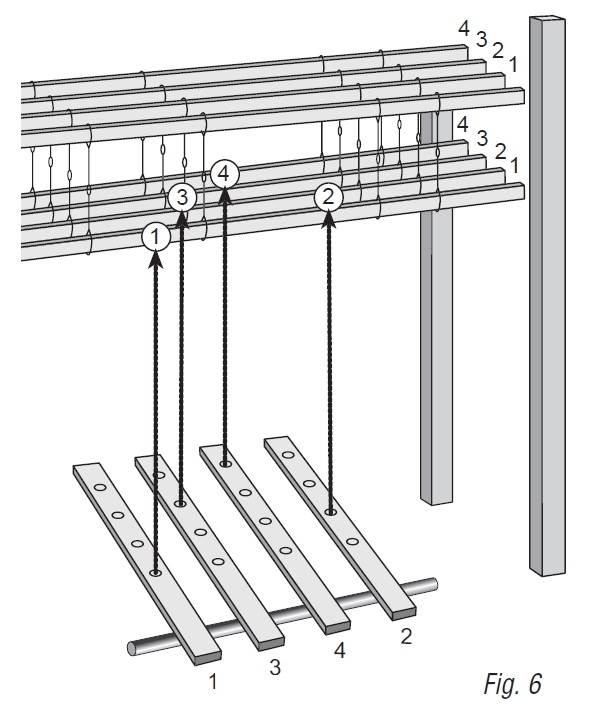 Jim thought of his10-shaft looms as 8-shaft looms with 2 extra shafts to use for selvedges. 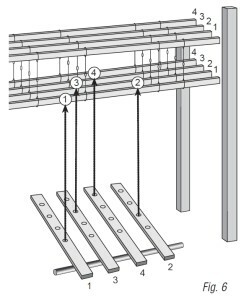 So if it is considered an 8-shaft loom, then 10 treadles is normal. What do I do if the apron rod bends? Slip off excess lashing on the tie-on bar. You only want the two bars to be lashed together for the actual width of the warp. What can I do if the shafts are floating up? The springs hold the shafts down when the sheds are made. If there are a lot of threads being lifted and not may at the bottom of the shed, you may need to increase the tension on the spring(s) for the shaft(s) that float up. Double up the springs or work the hook at the end of the spring into the spring itself to shorten it. You may need to do only some of the shafts—for only the sheds where the shafts float up. You generally want as little tension on a spring as needed—so the shafts lift with as little force as necessary. Why is my shed not clean? The bottom of the shed should rest on the shuttle race in the beater. If the top of the shed isn’t clean you may need to raise some of the shafts so they all come up to the same height. Why does the warp lose tension when I use the automatic tension system?